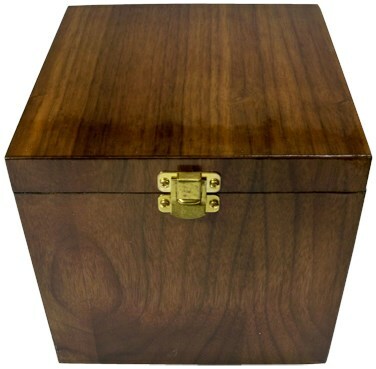 Sitting on your table is an attractive wooden chest that measures about 7 3/4" square. Not only does this box hold your props, which is clearly seen to be unremarkable, save for it's gorgeous quality! Invite a spectator up to help you with an experiment in mind control/hypnosis. Hand the box to the spectator for them to hold as you explain how easily susceptible some people are to hypnosis. Placing the box on the floor, you open the top and place a white silk inside. Now, you begin to hypnotize the spectator, explaining that the silk actually weighs a ton! Literally! The spectators are now instructed to try to lift the box. They can't! The spectator strains and sweats but is unable to budge the box! How is this possible? After all, you aren't standing on any false floors or using any superconductor magnets or even using a stooge! It must either be hypnosis or... magic! The box is opened the silk is removed and guess what -- the chest is now lifted easily! This version of the Light & Heavy Chest is new and improved, made of polished black walnut and manufactured by master craftsman Jay Leslie exclusively for Hocus Pocus! It's furniture quality is only enhanced by gleaming brass hardware, a beautifully finished interior, and a heavy duty gimmick that would require the Incredible Hulk to lift the box! The box can be shown freely, at all angles, before being set down. The simple act of either reaching in for an object or pulling out an object sets the gimmick in a second; it's always ready! No electricity, wires, magnets or magnetic concepts of any kind, electronics, and nothing is attached to you at all! There are no trays, false floors, or heavy tables used. The Gravity Box is entirely self-contained and features a brand new and ingenious principle! Its simplicity in operation is incredibly effective, and you will marvel at the method itself once you lay eyes upon it! Not only is it a gorgeous piece of art, it will rapidly become the highlight of your shows whether you perform serious mind-control or stand-up comedy or even children's shows!